Reverend Joseph Echols Lowery, also recognized as the “dean of the Civil Rights Movement,” has devoted his life to the nonviolent struggle for social change for over 50 years. Located just west of downtown Atlanta in the “West End” neighborhood, Joseph E. Lowery Blvd. coincidentally intersects both Martin Luther King Jr. Drive and Ralph David Abernathy Expressway. Joseph E. Lowery Blvd. also conveniently runs past Atlanta’s Historically Black Colleges and Universities: Clark Atlanta University, Spelman College, Morehouse College, and Morris Brown College. Also in 2001, on the campus of Clark Atlanta University, the Joseph and Evelyn Lowery Institute for Justice and Human Rights was established. Today, the Lowery Institute continues to train, develop, empower, and inspire young leaders to improve their communities for the common good. Experiencing racism at the age of 12-years-old, Lowery accidentally brushed against a white policeman entering his father’s shop, then the officer beat young Lowery with a billy club. 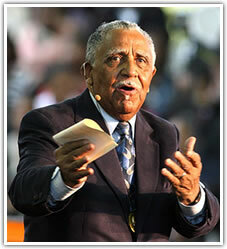 Born on October 6, 1921, in Huntsville, Alabama to a businessman and a schoolteacher, Lowery grew up in the segregated South. After attending Knoxville College and Wayne State University, Lowery went on to earn a bachelor’s degree from Paine College in Augusta, Georgia. He then entered the Paine Theological Seminary to become a Methodist minister. In 1947 Evelyn Gibson, daughter of activists Rev. Dr. Harry Evelyn Gibson, was set up on a blind date with Lowery by her younger sister. Gibson and Lowery dated for a year, and eventually got married April 5, 1948. The couple went on to have three daughters, Yvonne Kennedy, Karen Lowery, and Cheryl Lowery. Thank you for providing this information about Rev. Lowery! This blog was a great contribution to the documentation of Rev. Lowery’s accomplishments and lived experiences.